The Florida Gators played a fantastic game in nearly every way … except when it came to holding onto the ball. Second-half turnovers doomed Florida (19-15) as it fell hard to the No. 22 Auburn Tigers (25-9) on Saturday in the semifinals of the 2019 SEC Tournament. A late non-call on the final shot of the game did not help the Gators either as they would have had a chance to tie the game and force overtime with no time remaining. Let’s take a look at what went down as UF was eliminated from the SEC Tournament. 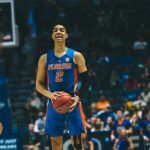 It was over when … Referees failed to call an obvious foul against Auburn as it intentionally fouled Florida freshman point guard Andrew Nembhard in the game’s final second. The non-call prevented the Gators from receiving three free throws with no time remaining, attempts that could have tied the game and force overtime. UF only had that opportunity because AU missed a free throw on the other end with a chance to increase its lead to four points and ice the game. The play that actually ended things came from guard Jared Harper, who hit a dagger three with 10.6 seconds left to put the Tigers up four points. The Gators and their thin lineup were absolutely gassed in the second half, a major reason for the late struggles that allowed Auburn to get back into the game and ultimately win. An 11-2 run by Florida gave it a four-point lead at the break as it shot a stunning 70 percent from the field and dominated the paint on both ends of the court. With the game tied at 47 in the second half, Auburn went on a 10-2 run to lead by eight. 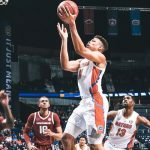 The Gators cut their deficit to a single point with 1 minute to play but saw freshman G Keyontae Johnson miss a triple prior to Harper’s dagger. What really doomed Florida was its turnovers. The Gators had just seven shot attempts and 12 giveaways in the first 13 minutes of the first half — compared to 22 and one, respectively, for the Tigers. Florida ultimately had 19 turnovers in the game, tying for the most under head coach Mike White, and only took 38 shots in the game, ranking it among the 10 lowest marks in program history. Auburn took 18 more shots than Florida (56-38) and had 15 fewer turnovers (5-19). That’s good enough to deserve to win. Exceptional efforts: Redshirt senior G Jalen Hudson, who hit a key three and layup late in the game, tied with a team-high 16 points on 5 of 6 shooting with 4 rebounds and 4 assists. Senior center Kevarrius Hayes was also stellar inside with 16 points and 12 boards, but he committed 5 turnovers and 4 fouls in the game. What it means: It would have been great for the Gators to win this game and advance to the SEC Tournament finals, but Florida was clearly gassed in the second half and already achieved what it needed to in locking up a bid in the 2019 NCAA Tournament. 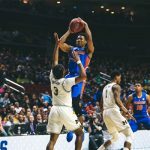 UF also likely gained a lot of confidence considering the way it played against two of the top 25 teams in the nation and during its three-game stand in Nashville, Tennessee. Now all it can do is wait and see. Up next: The Gators will almost assuredly play in the first round of the NCAA Tournament on Thursday or Friday. Selection Sunday begins at 6 p.m. ET with the show airing live on CBS.